In 1243, Thomas made a choice that set the path for his religious life. Against his family’s hopes, he joined the Dominican brotherhood. “Thomas had become attracted to the Dominicans with their ideal of evangelical poverty, study, and service to the Church without ecclesiastical preferments”. [iv] When word of this reached his family, they were not happy. Thomas’ mother made her way to Naples in an attempt to persuade him otherwise. “The Dominicans, fearing she would take him away, sent him to Rome, his ultimate destination being Paris or Cologne”. [v] Theodora sent a message to her other sons, asking them to stop their brother. It is not fully known as to how his brothers restrained Thomas, but he was locked up in a tower in the castle of Monte San Giovanni. No matter what his family said to convince him to leave the Dominican life, he was strong and unyielding. As the months passed on, Thomas wondered if he was going to be in custody forever. While praying in the tower, Thomas asked God if he was truly meant for the friar life. Soon after, two shining angels appeared, carrying a piece of cord with fifteen small knots, and tied it around his waist. [vi] From that point on he made a promise to himself that he would wear this cord at all times. As his life went on in prison, Thomas read and re-read the Bible, memorizing most of it. However, when Pope Innocent IV and Emperor Frederick II heard of Thomas’ imprisonment they gave orders for his release. The family followed suit for they were afraid of these religious leaders. Once Thomas was free, he pronounced his vows and was sent to Rome. Closely, Innocent IV examined his motives in joining the Friars Preachers, dismissed him with a blessing, and forbade any further interference with his vocation. [vii] In 1245, Thomas attended classes under Father Albert of Cologne, one of the most skillful professors of the order. It was here, at Cologne, that Thomas received his nickname, “The Dumb Ox”. Being a timid man, many believed him to be dim-witted. However, “after reading Aquinas’ thesis and thinking it brilliant, Father Albert proclaimed in Aquinas’ defense, ‘we call this young man a dumb ox, but his bellowing in doctrine will one day resound throughout the world’”. [viii] Later that year, Albert was sent to Paris and brought Thomas with him as a student. Three years later, they returned to Cologne, and Albert chose Thomas “as his assistant in the newly organized studium generale”, a Medieval university. [ix] At the age of twenty-five, Thomas was ordained to the priesthood by Archbishop of Cologne, Conrad of Hochstadt. As the years passed, the quality of Thomas’ works began to dwindle. 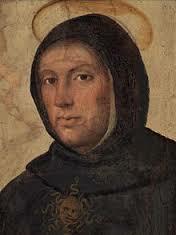 It was on December 6, 1273, that the forty-eight year old Thomas Aquinas ended his writing profession. During Mass, at the Dominican convent in Naples, Heaven was revealed to him in a vision and he soon lost all interest in theological questions or writing in general. A month later, on his way to Lyon, France, to serve on the Second Council, poor health overcame Thomas. On his deathbed, at the Cistercian monastery of Fossanova, Italy, Thomas “asked that the Song of Solomon be read to him from beginning to end”. 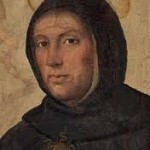 [xii] On March 7, 1274, Saint Thomas Aquinas passed away. As the patron saint of Catholic academics and theologians, Thomas was canonized in 1323 by Pope John XXI. [i] Norman W. Pittinger, Saint Thomas Aquinas: The Angelic Doctor. (New York: F. Watts, 1969), 3. Hereafter Pittinger followed by page number. [ii] W. A. Wallace, “Thomas Aquinas, St.” New Catholic Encyclopedia. 2nd ed. Vol. 14. (Detroit: Thomson/Gale, 2003), 14. Hereafter Wallace followed by page number. [v] Daniel Kennedy. “St. Thomas Aquinas.” The Catholic Encyclopedia. Vol. 14. (New York: Robert Appleton Company, 1912), 664. <http://www.newadvent.org/cathen/14663b.htm> (Accessed 9 December, 2012). Hereafter Kennedy. [vi] Mary Fabyan Windeatt, Saint Thomas Aquinas: The Story of “The Dumb Ox” (Rockford, IL: Tan, 1943), 33. [viii] <http://www.biography.com/people/st-thomas-aquinas-9187231> Accessed 9 December, 2012. Hereafter Biography. Angela Adkins is a senior at Reicher Catholic High School in Waco, TX. She hopes to attend Baylor University in Waco.